"...we are grateful for your help and suggestions. Jacob loves the school and I know that we probably would not have looked there without your input." "Good decisions are a direct result of BETTER PERSPECTIVE." "You CAN connect with your son or daughter with clarity and perspective, instead of guilt or anxiety." " The more organized you are, the more options you'll have - and the better your results will be!" "The schools are more and more using aid to attract a student body that appeals to them and increase their net revenues." "Financial concerns are more about students' options than just lowering costs"
Helps students determine how well he or she is suited for a particular college major. Helps parents know which colleges are a good fit for their child's personal and academic development. Clarifies how finances will be assessed and identifies numerous desirable and affordable colleges. Develops an admissions & financial aid strategy to position clients for the best possible outcome. how nice the college "looks"
At the core of our service is the objective of helping your student identify the optimal size, learning style, academic competitiveness, curriculum, location and values needed for his or her college success. A good fit is vital to every student's happiness and achievement. Our goal is to build upon admissions strategies that allow your family to control the critical elements of college decision-making. Frequently, parents and students oversimplify the college selection process, relying too much on rankings or school reputation. The College Advisor of New England works with students and their parents to produce college decisions that are clear, smart, and unburdened by anxiety. Because we have spent (and continue to spend) a significant portion of our time visiting and critiquing colleges throughout the region and the country, we can identify options and offer personal insights specific to each individual. We effectively address issues students or parents may not see objectively and can offer solutions that families may not have considered. Your college search does not end at a “list” of colleges, but continues throughout the process with our support by revising recommendations as students' ideas about college change. A family’s search process may also require financial strategies in order to identify the best fit for both student and family. The College Advisor of New England is uniquely qualified to help. Research shows that 65% of all American college students change their career plans at least one time while enrolled. What happens if their college doesn’t offer their new major? What if credits don’t transfer? A college education is too expensive to risk spending valuable time in the wrong direction. Many students aren't aware of all the variables to consider, or even the wide range of options available to them. We utilize a series of career and learning style assessments in order to counsel your student to match their abilities and interests to appropriate college majors and career directions. While we don’t expect a teenager to definitively decide on their career, with more self-awareness, he or she is better able to select a college based on the most appropriate curriculum and values. The college application will affect a student's opportunities for admission and scholarships. Often in the college application process, students feel judged. They respond by trying to impress, rather than displaying their genuine attributes. By understanding the intent behind the application questions, students are in a position to communicate in a more genuine, more effective manner. The college application essay is an opportunity for the student to express what makes him or her unique. In addition to helping our students find captivating ideas for their essays, we help them develop confidence in writing about themselves. Our staff reviews several drafts with an eye towards continuity, sincerity and passion. While maintaining the integrity of the student's original work, we make recommendations, encouraging the student to enhance the final product. If you were scheduled to play a championship game, it would make sense to scout the competition and strategize about how to parlay your strengths. Standardized tests should be approached with the same attitude. Like the SAT, the ACT is accepted at almost every college and university in the country. However, these two assessment tests are structured differently. Usually, a student is better suited for one or the other. We provide a proprietary diagnostic assessment to determine which is best. It can be critical that your child make the right choice as to which test they take. We administer diagnostic exams to predict student scores, provide preparation strategies for improving scores, and recommend which of the two tests might be a better choice. 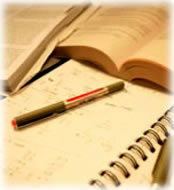 Note: In addition to admission decisions, many scholarships granted by colleges are hinged on standardized test scores. There are hundreds of colleges from which to choose. It doesn’t make sense for a family to jeopardize its financial health in order for a student to attend a specific institution when there are suitable alternatives. Sacrificing retirement or other financial goals is neither necessary, nor in our view, a good college decision. Before your teenager becomes emotionally bonded to a school, you should know if it is the best school at the best price. Unfortunately, college and universities will not disclose your bottom line cost until after your financial aid forms have been submitted in the spring of the senior year. This is of no strategic value. Regardless of family income, many families do not need to pay a school's published costs. On the other hand, just because you are eligible for aid does not mean you’ll receive it. The College Advisor of New England can help you sort through this apparent contradiction. The methods for determining eligibility vary among institutions; most schools use financial aid as a tool to shape its size and type of student body. Most colleges and universities no longer simply consider your “ability to pay”, but also your “willingness to attend”. Affordability strategy is not just about the numbers. The College Advisor of New England understands these nuances and is in the unique position to share the benefits of our experience and database to ensure your family gets the best results. Where does your student fit in each school's “merit scholarship” and “admit” pools? The College Advisor of New England will calculate your Expected Family Contribution through Needs Analysis Formulas, predict aid packages of your schools, and conduct an Affordability Preview. Your family will know in advance exactly what is required to fund the education and take control of your cash flow. Without an accurate measuring stick, you may spend valuable time visiting schools that are not financially attainable. The student is then left with less appropriate college choices. You want to know what you can afford BEFORE your child becomes emotionally attached to a school. While some financial “experts” or web services say they can reduce your college costs, few if any can personally relate to a teenager and help them understand exciting options within the financial realities of the family. This is a key strength of The College Advisor of New England. 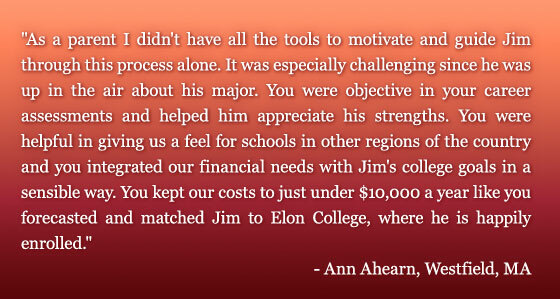 We help students make a good decision for themselves and for the family. College admissions officers understand the vast differences that exist among our nation’s 30,000 high schools, while many parents do not. This is why a thorough review of a student’s high school transcript is critical. After an assessment of a student’s grades, interests, and academic skills, we recommend appropriate courses to maximize their chance for success in high school. Every college is unique, but in general, most colleges favor students who take more challenging classes. You can observe a campus when you tour it, or you can critique it. Our service provides guidance on how to make the most of campus visits. We offer specific suggestions as to how the parents’ role can be more effective without taking over the process. We give students strategies and tools to empower them and to help them take more ownership of the opportunity. We also offer suggestions for admissions interviews so that students feel confident in putting their best foot forward, while remaining true to themselves. In addition to personalized counseling meetings, every family receives these tools to help steer them through the process. This enables everyone in the family to be “on the same page” when it comes to deadlines, directions, reminders and tips. 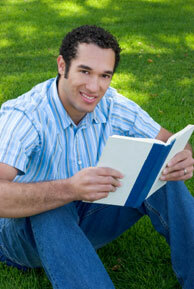 The College Advisor of New England helps eliminate confusion and anxiety. We save you time & money and give you peace of mind. © The College Advisor of New England, Inc.